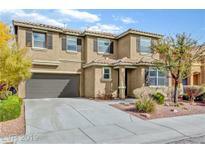 Below you can view all the homes for sale in the Toscana Vinyards At Souther Highlands subdivision located in Las Vegas Nevada. Listings in Toscana Vinyards At Souther Highlands are updated daily from data we receive from the Las Vegas multiple listing service. To learn more about any of these homes or to receive custom notifications when a new property is listed for sale in Toscana Vinyards At Souther Highlands, give us a call at 702-323-5933. Amazing 3 bed, 2.5 bath w/loft *Vaulted ceilings in the formal Living/Dining room *Stained concrete floors, carpet/tile, stainless Steel appliances, custom wood baseboards throughout, downstairs laundry room, master upstairs w/double door entrance, walk-in closet, double sink, separate tub/shower*A must see! 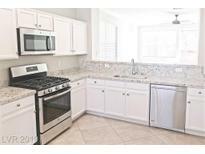 MLS#2088373. Keller Williams Southern Nevada. Best of Las Vegas #1 Master Plan Community. MLS#2074310. Keller Williams Southern Nevada. Upstairs loft and all three bedrooms have a walk in closets with built in shelves. Double sinks in master bath! MLS#2070466. Evolve Realty. Great two story in Southern Highlands located at quiet cul-de-sac, The home features ss appliances, All bedrooms are spacious with walk in closets, The 2 car garage is finished with lots of options for storage, Beautiful desert landscaping in front with great curb appeal & fully landscaped backyard with matured palms & synthetic grass MLS#2065783. 1st Priority Realty, LLC. Large Family Room With Fireplace That Opens To A Private Backyard Featuring, Built In Bbq Area And Sparkling Pool With Waterfall. A Must See! MLS#2056508. Vibrant Realty. * Super Private Backyard W/Flagstone Patio And Cover* Easy Care Desert Landscaping* Only 1 Hoa In Southern Highlands-hurry! MLS#2052030. Keller Williams Realty Las Vegas.